Now Archived! PolarConnect event with Kim Young and researcher Christina Minions from Weston, Massachusetts on 8 April 2019. You can access this and other events on the PolarConnect Archives site. The smaller CO2 Flux Chambers, FC, are the control chambers and do not warm the ground. Photo by John Wood This NASA-funded project aims to improve understanding seasonal changes in the amount of carbon dioxide (CO2) released from permafrost soils in Alaska. 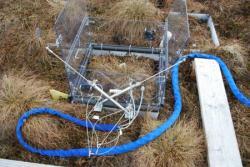 This project is very exciting because they are using soil flux chambers that are capable of monitoring CO2 during the cold winter months. Information resulting from this study will be used to improve the understanding of local earth systems processes that affect carbon flux in various parts of Alaska. 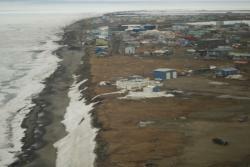 An aerial view of Barrow, Alaska. Photo by John Wood. The team will reach the field sites at Eight Mile Lake, along the Dalton Highway, Toolik and Utqiaġvik (Barrow) via truck and up to 3 miles of hiking. Atqasuk is reached by small plane. Toolik Field Station is operated by the Institute of Arctic Biology (IAB) at the University of Alaska Fairbanks (UAF) and has hosted hundreds of researchers and students every year since 1975. We will also conduct research at the Eight Mile Lake watershed on the North Slope of the Alaska Range near Healy, Alaska. The Eight Mile Lake site has been affiliated with the Bonanza Creek LTER and IAB at UAF since 2008. Educator Kim Young and Researcher Christina Minions from the Winter Respiration in the Arctic Team discuss permafrost in Alaska and what climate factors are affecting it. This presentation was broadcast live from Weston, Massachusetts on 8 April 2019. Kimberly Young is a World History Teacher at Weston High School in Weston, Massachusetts. Over her fourteen-year teaching career she has focused on promoting the development of student global competence through interdisciplinary and experiential learning. She served for ten years as Global Education Coordinator, facilitating one-to-one exchange programs between WHS, France, Brazil, and China. Kim has received the National Council for Social Studies James M. Becker Award for Global Understanding and was a member of the inaugural graduating class of the Global Competence Certificate Program. In her free time she enjoys spinning, kiteboarding, snowboarding, and field hockey. Sue Natali is an assistant scientist at Wood Hole Research Center (WHRC). Her research focuses on the interactions and feedbacks between plant and soil communities and their environment and seeks to better understand the impacts of environmental change on ecological processes and biogeochemical cycles. Dr. Natali conducts her research in boreal and tundra ecosystems in Alaska and Siberia. Learn more about Dr. Natali and her work at the WHRC webpage. I loved your post. It is so full of good ideas for the classroom and beyond. How did you get the Google Expeditions Exploration Kit?